Riding an all-terrain vehicle is an awesome way to get up close and see Ohio's forests and natural areas. Four state forests have over 38 miles of riding trails for novices to experts. These trails are open from spring through late autumn. Ohio also offers miles of private trail, sand hills, mud pits and challenge tracks. 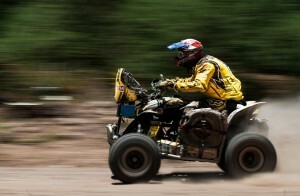 Before heading out on the trail, check to see that you're in compliance with the Ohio's ATV rules. Your ATV must be titled and registered every three years in Ohio. You will receive a license plate and validation decals for your ATV when you register. This license plate doesn't give you the right to drive your ATV on public roadways. If you have a valid driver's license, you're legal to operate an ATV in Ohio. Children age 12 to 16 are allowed to operate an ATV as long as they are under the direct supervision of a parent or a guardian over age 18. Direct supervision is means you must maintain verbal contact at all times. Children under 16 may operate ATVs unsupervised on private property. Driving any motorized vehicle under the influence of drugs or alcohol is illegal. Doing so will result in suspension of your driver's license and possible jail time and fines. Jim Allen provides AMSOIL custom synthetic oil and lubrication solutions to all customer types in Columbus and Cleveland. Call 877-777-1645 or order online.